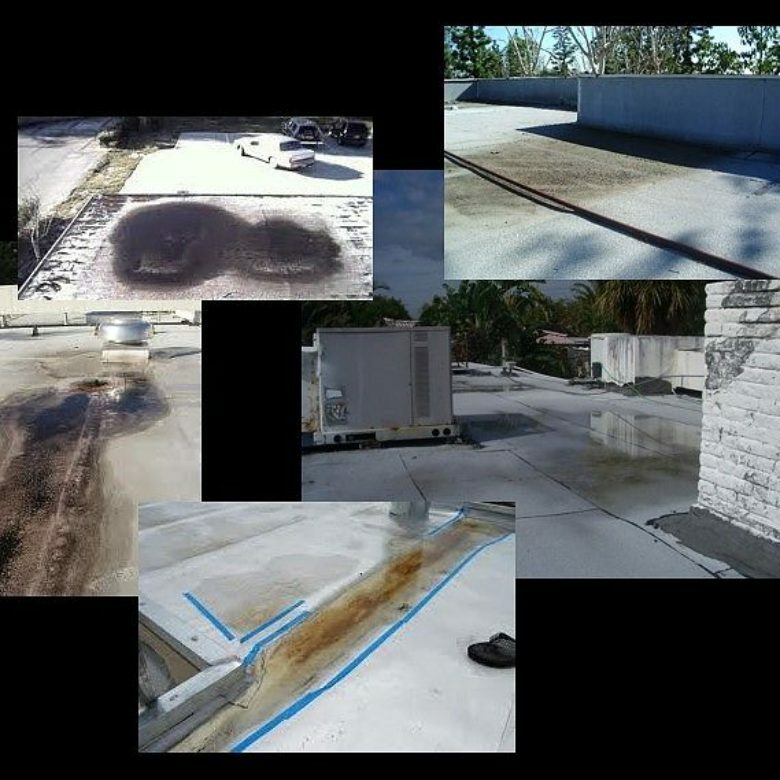 Flat roofs on commercial buildings have many benefits, and if properly maintained can last even up to 50 years. 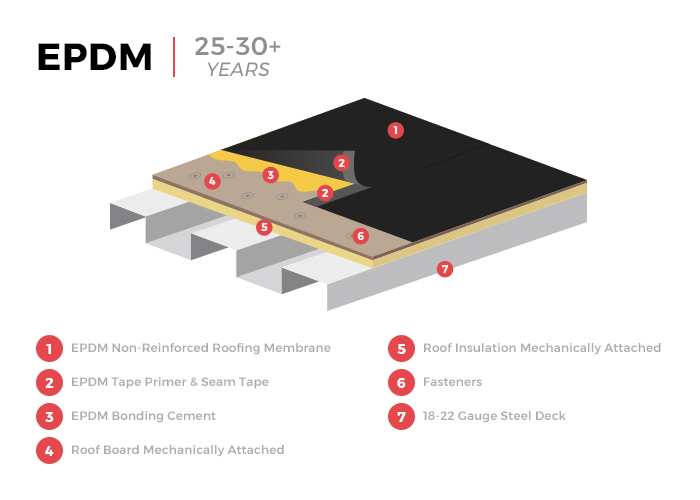 There are many different types of flat roofs that have been used in the last few decades; typically, the three membrane types we’ll discuss are used. 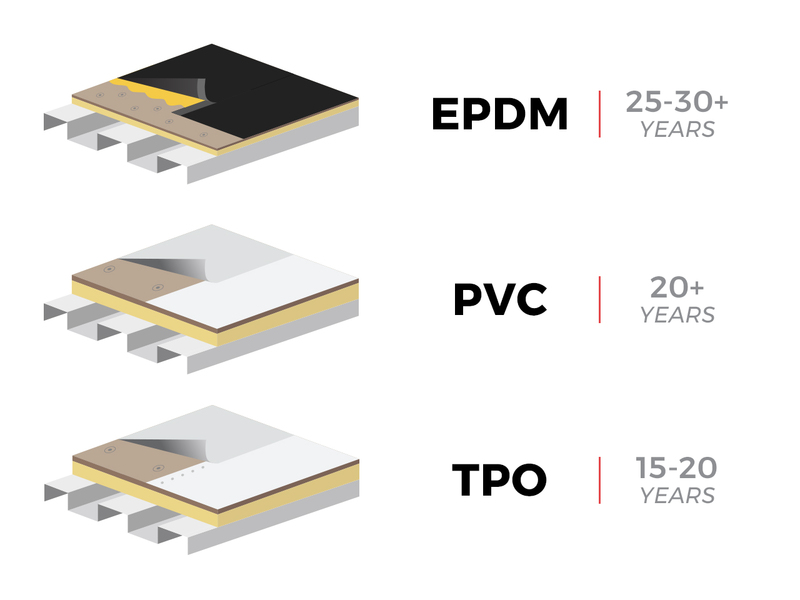 With all the choices and newer products coming out, commercial building owners want to know the average flat roof membrane lifespan. EPDM is a synthetic rubber material that’s been around the longest. It’s commonly used for commercial roofs because it’s low-cost, easy to apply, and last 25-30 years or more. PVC (vinyl) membrane roofing costs the most of the three, but provide the best energy efficiency because of its UV resistance and white color. PVC flat roof membranes last 20 years plus and are a solid choice. TPO flat roof membrane is Thermoplastic Polyolefin, which is a single-ply roofing either mechanically fastened, fully adhered, or ballasted. The seam strength is stronger than EPDM and there are no plasticizers added like with PVC membranes, so are a “greener” choice. TPO is not as flexible as PVC and generally last 15-20 years, yet are less expensive than PVC. There are many factors that determine how long a commercial building’s flat roof will last. 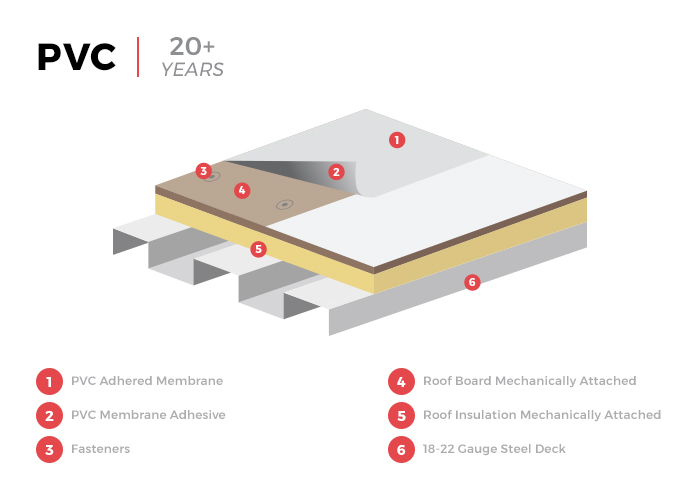 In general, a flat roof membrane will last anywhere from 10-50 years depending on these factors. All three of these flat roof membranes have their benefits and drawbacks but are all commonly used today on commercial flat roofs. Each year new technological innovations are making all these flat roof membranes more durable, easier to apply, and are improving their longevity. For instance, the new improved TPO membranes have great promise, but not enough time has passed to tell just how long they’ll last. EPDM is considered a “base” system but is constantly improving. What this means is choosing the right installer is just as important as choosing the right flat roof membrane. Consult with a roofing professional with expertise and experience in applying all three types of membranes. This ensures you’ll not only make the right choice in a system type but also have the best chance of a quality installation. Maintaining a flat roof is an important factor in determining how long the membrane will last. Making sure there’s proper draining is the most important thing you can do. 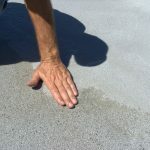 If flat roof slop ponding occurs, eventually this will seep through and cause costly damage to the surface underneath. Often this damage isn’t detected until rot and mold are present. Checking the seams, flashings, and all around the rooftop penetrations, periodically and after rainstorms should be done. Detecting any damage or worn areas before there’s water leakage will increase the longevity of the membrane and save any costly damage to the foundation of the building underneath. 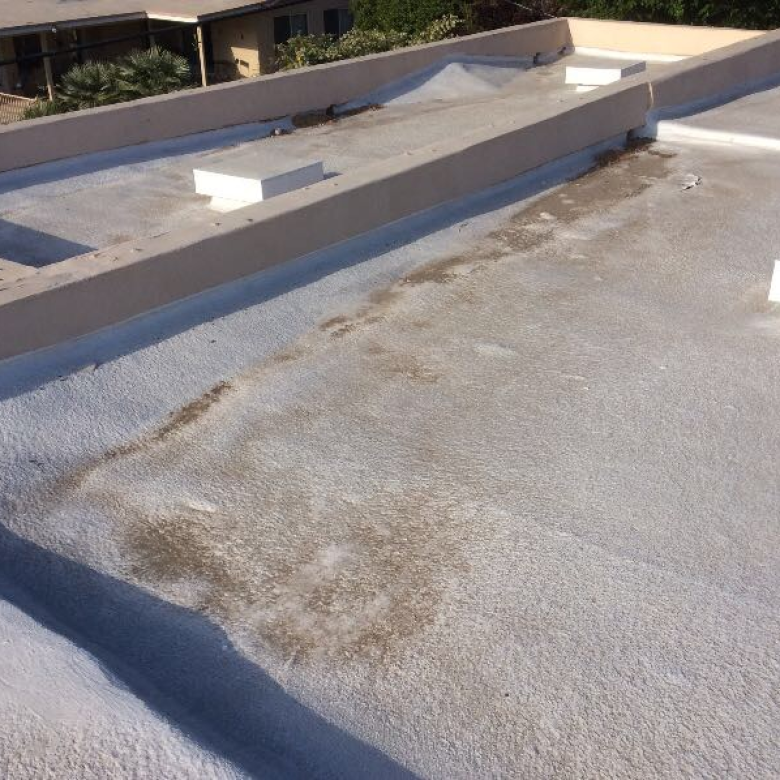 A typical commercial flat roof membrane should last on average 20-25 years before needing to be replaced. On the shorter end it could need replacing in 10 years, and on the longer end, it could last even 50 or more years. 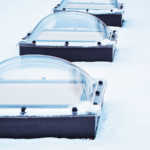 This depends on the climate, quality of the installation, type of membrane, maintenance, and roof penetration. 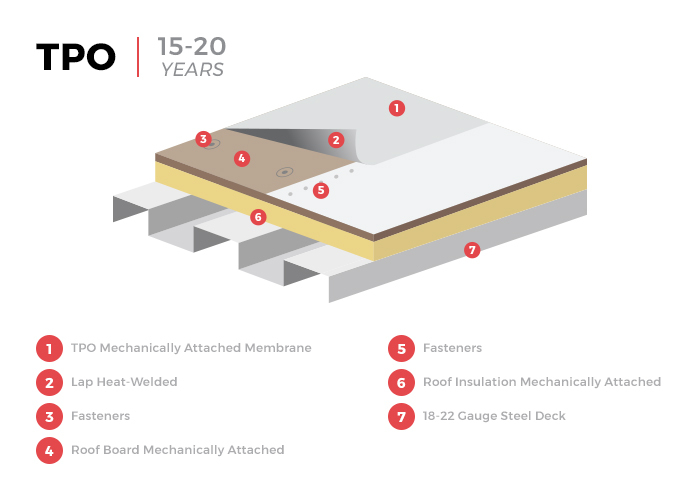 Whichever type of flat roof membrane you’re dealing with, RoofSlope can help you maintain it properly with our innovative product. The RoofSlope product is a cost-effective solution for correcting inadequate drainage without compromising the integrity of the existing membrane system. Apply RoofSlope to areas of your flat roof where water is ponding. Our patented product is UV stable, durable (6,000 PSI), cures in 24 hours, apply in one coat, and bonds over multiple substrates. Roofing contractors and commercial building owners can increase the longevity and effectiveness of their flat roof membranes with RoofSlope. To learn more please contact us today.